Recently I was able to try out two new Vitamin C products from MyChelle Dermaceuticals, one is their new Perfect C PRO Speed Peel (10% L-Ascorbic Acid Vitamin C) and the other is their Perfect C Serum (17% L-Ascorbic Acid Vitamin C). Below are my reviews of both of the products. 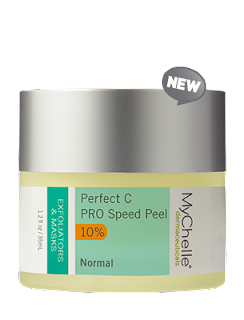 This peel is a professional-level, one-step, one-minute, fast-acting 25% Citrus Fruit puree peel. It is formulated with 10% L-Ascorbic Acid blended with L-Lactic Acid, Plant C-Stem™, and Retinal to deliver youthful, glowing skin. For evening use only, as this will make you more sensitive to the sun. Directions for use: apply a thin layer once per week after cleansing. Avoid eye area and do not apply on broken or irritated skin. Leave on for 1 minute maximum. Tingling is likely to occur. Remove thoroughly with cool water. Post-treatment redness is common and will subside. Product color will darken over time. Due to professional nature of product, a patch test is recommended before use, try patch test on inner arm. This product is not recommended for very sensitive skin. It is recommended for normal, combination, dry, oily and acneic skin types. What is does is lighten hyperpigmentation, help even out skin tone, even out skin texture and help with fine lines and a little bit with wrinkles. It is an anti-aging peel that is great for use with photoaging and photodamage. I found this peel to be strong, but not too strong for me. I am used to Vitamin C products. I love how it tingles the skin and makes it glow. After several uses is when you should notice skin improvement. Right away you will notice skin softening, but to see real improvement in photodamage, it takes a couple of weeks. Evening out skin texture also takes a week or two. To notice how fine lines are doing, it takes only about 3-4 applications and bam! Fine lines seem gone. This peel is all that and then some. I love it. I think it is great for helping to aid in getting skin into shape. To help keep it in shape, use the Vitamin C Serum listed below. This advanced multi-tasking Vitamin C formula reduces the appearance of fine lines and wrinkles. The serum contains a high active level of 17% L-Ascorbic Acid, the only effective anti-aging form of Vitamin C, and Buddleja Plant Stem Cells brighten, protect against photo-damage, and combat the visible signs of aging. Dermatologist and Allergy tested. Made without GMO, Gluten, Parabens, Petroleum, Phthalates, Silicones, Sulfates, Ureas, Artificial Fragrances, and Artificial Colors. Vegan. Cruelty-free. 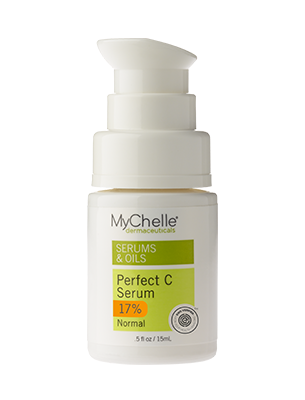 17% L-Ascorbic Acid Vitamin C reduces visible lines and wrinkles, it brightens skin, perfects skin and strengthens skin. To use: apply one pump in the morning after cleansing. If layering serums, use Perfect C Serum first and follow with your favorite moisturizer. Now, this serum definitely helps with pigmentation issues, fine lines and wrinkles, it helps the skin build collagen to get rid of fine lines and wrinkles. Vitamin C also evens out the skin tone and texture. It really is one of the best anti-aging tools that we have. This is an extra-strength Vitamin C Serum too, which means it does all of this quicker, and with less side effects because of the pH level of the serum. It has stem cells in it to fight off free radicals and to protect against photo-damage. I'm very happy with the results of this serum which have lightened my skin and have evened out my skin texture. It has also helped with the tiniest of wrinkles I had forming around my eyes and mouth. This serum is for all skin types except the most sensitive. The products work and they do their job well. I would love to have my entire regimen be from MyChelle, that is how much I love this line. MyChelle Dermaceuticals is available online from www.mychelle.com. Like MyChelle on Facebook: https://www.facebook.com/MyChelleDermaceuticals; Follow MyChelle on Twitter: @mychelle; Follow MyChelle on Pinterest: https://www.pinterest.com/mychellebeauty/; Follow MyChelle on Instagram: https://www.instagram.com/mychellebeauty/ and Subscribe to MyChelle on YouTube: https://www.youtube.com/user/MyChelleSkinCare.